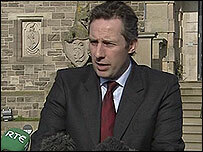 The DUP's Ian Paisley Jnr has resigned from his position as a junior minister in the Northern Ireland Assembly. Mr Paisley, who will stay in the post until a replacement is found, said he would continue in his role as an assembly member for North Antrim. "I can't express strongly enough that I am not going because of some hidden or some revealed wrongdoing," he said. The move follows criticism over his links to developer Seymour Sweeney and allegations he lobbied on his behalf. "The past 10 months have not been without controversy," Mr Paisley said. "Personal criticism, unfounded allegations, innuendo and attacks on me personally (have been) followed by ombudsman's reports that have cleared me. The BBC reported in December on his lobbying over a £50m government land deal in his North Antrim constituency. The SDLP's Declan O'Loan had asked the assembly's standards and privileges committee to see if rules were broken. However, Ombudsman Tom Frawley said it was not a valid complaint as media reports did not constitute evidence. The reports focused on a land deal at Ballee, which involved a number of the junior minister's constituents and property developer Seymour Sweeney. 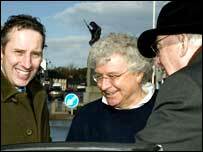 Sinn Fein North Antrim assembly member Daithi McKay welcomed Mr Paisley's resignation. "There are still a number of questions that he needs to answer in relation to the Giant's Causeway and other developments," he said. "Obviously Paisley Jnr has recognised that it is now time to resign from his position as a junior minister."